Meet the APF force being trained as the nucleus of a new army, defending region Kurds claimed despite opposition from all sides. In a leafy field in Syria, fighters in beige fatigues negotiate an obstacle course as they are trained to defend a Kurdish federal region across the country's north. Clutching rifles under a bright spring sun, the men are among thousands undergoing obligatory nine-month training to join the Autonomous Protection Forces. The APF, its commander-in-chief Renas Roza says, will be responsible for defending the federal region declared last month at a Kurdish-led conference. "This is the nucleus of a new army that will take up the defense of the federal region in northern Syria," Roza tells AFP in his headquarters at Amuda near the border with Turkey. The clean-shaven commander sits under a large poster bearing the APF logo - a long, curved sword crossed over a rifle below a red five-point star. Roza says thousands of Kurdish, Arab and Syriac Christian men between the ages of 18 and 30 have completed the compulsory training. For the first two months, conscripts are taught military structure and tactics, and then have lessons on human rights and interaction with civilians. Three stages of training are led by the powerful People's Protection Units (YPG), the military arm of the leading Kurdish Democratic Union Party (PYD). Fadi Abdo Lahdo, a Syriac fighter training in the Bawr camp near Rmeilan, says his trainers are from the YPG's commando force. "We're learning how to cross over both cement barriers and natural barriers," says the fair-haired fighter, squinting in the sunlight. Other training sessions are administered by civic institutions. "I served five months and I still have four months before I finish my service," says Rinas Ahmad, an 18-year-old conscript with gelled hair. "We were trained on military life and on how to deal with civilians so we don't become like the Syrian (government) army," Ahmad says. Syria's Kurds have both exploited and benefited from the chaos of the five-year-war to expand their control across northern parts of thecountry. When the regime's armed forces withdrew from Kurdish-majority areas in 2012, Kurds filled the void with a system of three "autonomous administrations." The three cantons, known from west to east as Afrin, Kobane and Jazire, already feature their own independent police forces, driving licenses and schools. In March, a Kurdish-led summit in Rmeilan announced that it would establish a "federal region" uniting the cantons. It elected a 31-member assembly tasked with laying the groundwork for the federal region by September. The announcement was swiftly shot down by both the mainstream opposition and the regime, which categorically reject a federal system for Syria. In anti-government demonstrations across the country, some protesters burned the Kurdish flag to show their opposition to federalism. 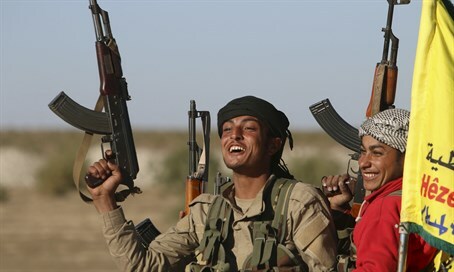 Syria's Kurds have continued their preparations nevertheless. Training camps currently operate in the Afrin and Jazire cantons and will open soon in Kobane, Roza says. The APF is also rounding up anyone who has yet to complete his nine-month service. "We check people's papers as they pass through checkpoints. If they have not done the training, we take them there," an APF spokesman says. An Arab APF trainee, who spoke on condition of anonymity, says he was detained at a Kurdish-run checkpoint as he drove to work. Non-Kurdish residents living under the PYD-run cantons were already complaining about a six-month period of compulsory military service run by the YPG, but the new training period is three months longer. As the federal region's future army, APF units have begun deploying to areas recently captured from the Islamic State (ISIS) jihadist group. Although they are not yet involved in front-line fighting, they are increasingly cooperating with the YPG and the Kurdish-Arab Syrian Democratic Forces. The APF moves in to secure towns that the YPG or the SDF have seized from ISIS - such as Shadadi in Hasakeh province, which the SDF captured in February. Kurdish forces have led the fight against ISIS since the jihadist group emerged in Syria in 2013, scoring several major victories in the recapture of key border towns, like Kobane, last year.